Twitter is introducing a music streaming application that will let users listen to their favorite tracks while tweeting. This will probably help users to discover the listening habits of their friends and followers, as well. However, what form of the music application from Twitter will take, is not so clear. Meanwhile, a Twitter Music website is now live, at http://music.twitter.com, confirming that the service is on its way. On Friday, Twitter included a page on their website containing Twitter’s logo with “#music”, and a sign-in tab at the bottom. Attempting to sign-in, redirects users to an authorization request for an app called “Trending Music Web”, although it does not grant users and page remains same as it is. Since its acquisition by Twitter, We Are Hunted founder Stephen Phillips has tweeted several playable tracks coming from both Rdio and Soundcloud, implying that both services may be part of Twitter’s imminent app. It’s unclear exactly what Trending Music Web is, the name implies it could be the web portion of a wider, cross-platform Trending Music service. The #music site’s sign-in button is currently non-functional, but with the page already available to view at such an obvious URL, I’d expect it to go live soon enough. The promo offers by Microsoft for Windows 8 are ending shortly. The prices for Windows 8 upgrade editions would be more expensive starting from February 1st, 2013. Some claimed Windows 8 a failure, but eventually Microsoft is “seeing good momentum with Windows 8? and has sold out 60 million copies so far. If poor sales of Windows 8 were the case, Microsoft would not have increased the prices. Today I’d like to share the pricing details for the Windows 8 upgrade editions that will begin in February. I’d also remind you to take advantage of the great upgrade offer which lasts until January 31st 2013. But we Microsoft has promotional offer available until January 31st 2013, you can upgrade to Windows 8 Pro for just $39.99 ERP* (U.S.) via Windows.com using the Windows 8 Upgrade Assistant or pick up a DVD copy at a local retailer for just $69.99 ERP* (U.S.). If you bought an eligible Windows 7 PC between June 2nd and January 31st, 2013 – be sure to register for the Windows Upgrade Offer and upgrade to Windows 8 Pro for only $14.99 ERP*** (U.S.). If you upgrade to the Windows 8 edition or buy a PC with the Windows 8 edition pre-installed and want to move to the Windows 8 Pro edition– you can purchase the Windows 8 Pro Pack (previously known as Windows Anytime Upgrade) directly within Windows 8 by going to the Start screen and typing “Add Features to Windows 8” and at participating retailers for $69.99 MSRP (U.S.) until January 31st. If are running Windows 8 Pro and want Windows Media Center and DVD playback, you can add the Windows 8 Media Center Pack for free until January 31st**. **When moving from the Windows 8 edition to Windows 8 Pro via the Windows 8 Pro Pack – you receive the Windows 8 Media Center Pack and won’t need to install it separately. *** The last day to register for the Windows Upgrade Offer is February 28th, 2013. Now this is what amazes everyone! A 9 year old boy from California, named Pranav Kalyan has become the youngest Microsoft Certified Technology Specialist (MCTS). A nine-year-old boy of Indian origin, whose father hails from Tamil Nadu, Pranav Kalyan is a 4th grade student at Willow Elementary School in California and has passed the MCTS exam in ASP.NET Framework 3.5 on 12 January. He dreams to be a scientist in the future. Pranav has broken record of Babar Iqbal from Dubai who achieved the sanction at the age of 12. This kid has become the youngest Microsoft Certified Technology Specialist in the world. Speaking to TOI over phone, Pranav said he wanted to be a scientist. “I was introduced to the world of computers when I was two,” he said. Pranav found that his love for maths and the challenge of solving complicated problems helped him write computer programs, which required logical skills. The boy, who started to write simple HTML programs when he was six years old, has been seriously preparing himself for the past 18 months. “I spend at least eight hours a day on computer programming during holidays,” he said. Welcome to Tech Crawlerz. I have been away from writing on my blog. So sincere apologies. Webmail was first introduced with HotmaiL in 1996. Back then, it was novel to have a personal email address you could keep for life – one that was totally independent from your business or internet service provider. Eight years later, Google introduced Gmail, which included 1 GB of storage and inbox search. And while Gmail and other webmail services like Hotmail have added some features since then, not much has fundamentally changed in webmail over the last 8 years – though yesterday’s frustrations about the small size of inboxes are now things of the past. Microsoft’s new Web-based email, Outlook.com impressed from the first moment we saw it. It’s clear, fast user interface, leading tools for maintaining a clean, junk-free inbox, social-network integrations, and built in viewers for things like videos and documents, a new personal email service that re-imagines the way that people use email – from a cleaner look, to fewer and less obtrusive ads, to new connections to social media sites like Facebook and Twitter. Microsoft introduced Outlook.com, REDMOND, Wash. – July 31, 2012 – Outlook.com, Microsoft’s new personal email service that launches in preview form today, offers the first major improvement to cloud mail in eight years, said Chris Jones, Microsoft’s Corporate Vice President of Windows Live. Outlook.com is a webmail service from Microsoft currently available in a preview, which will eventually replace Hotmail.Outlook.com features Microsoft’s Metro design language, and closely mimics the interface of the Outlook desktop software. During the preview, new @outlook.com email addresses were made available to all users, and existing Hotmail users were able to opt into the Outlook.com interface. After less than four months since its release, Outlook.com attracted over 25 million users, and Microsoft found that 4 out of 5 testers said they’d dump Gmail for Outlook.com. Since that release was actually designated a “preview,” it’s probably not a surprise that Microsoft has already updated the service based on feedback, as well as adding an Android app to the ways you can access your Outlook.com account. The new features, including an Archive button similar to Gmail’s, more keyboard shortcuts, and more inbox customization, will start appearing in Outlook.com user’s accounts over the next few weeks. You can get your own account at Outlook.com, with a new @outlook.com email address. Existing users of Hotmail, MSN Mail, and Windows Live Mail will still be able to sign up for new @hotmail, @live, or @msn account for a while. Eventually the new service will replace all of the earlier ones, though there’s no scheduled date for that yet, and they’ll still be able to keep their @hotmail addresses if they choose. Outlook.com uses Ajax programming techniques and supports later versions of Internet Explorer, Google Chrome, Firefox and Safari. Some of its features include keyboard controls giving the ability to navigate around the page without using the mouse, the ability to search the user’s messages including structured query syntax such as “from:ebay”, message filters, folder-based organization of messages, auto-completion of contact addresses when composing, contact grouping, importing and exporting of contacts as CSV files, rich text formatting, rich text signatures, spam filtering and virus scanning, support for multiple addresses, and different language versions. Hope by reading this mail you must have known the new service by Microsoft. “In advance of one of the most significant waves of product launches in Microsoft’s history, today we are unveiling a new logo for the company.” – Microsoft Official Blog. 25 years later, Microsoft unveils a revamped Corporate Logo. It had been 25 Years since Microsoft had updated their Corporate LOGO. On Thursday morning i.e. 23rd August 2012, Microsoft unveiled the new Look of their logo. The graphic designers have a split views on it. Microsoft has a new look. The company just took the wraps off its new corporate branding. Replacing its previous logo is a staunch, four-pane colored window very reminiscent of the grid layout scheme found in Microsoft’s latest products. Microsoft is also spelled in a simple, bond font. The grid clearly resembles Microsoft’s latest design started with Zune and later adopted in Xbox 360. Windows Phone and most recently Windows 8. It’s clean, simple. The symbol in the new logo should look familiar. It’s merger of Microsoft Store Logo with Window’s 8. The Logo which will now be disappeared was 25 years old i.e. since 1987. The current new version of the logo is Microsoft’s 5th corporate logo in 37 years. Also this logo is the first to incorporate the symbol alongside Microsoft name. The previous versions simply had Microsoft written. As noted by Seattle Times, this latest version includes a subtle nod to the original 1975-1979 logo by connecting the F and the T. As per the poll on Seattle Times, the new logo is more liked by them. Here below have a look at the previous logos of Microsoft. Have a look at this video which signifies the new Logo. The video demonstrated the new logo in Digital motion. “The logo has two components: the logotype and the symbol. For the logotype, we are using the Segoe font which is the same font we use in our products as well as our marketing communications.” – TechNet. “It’s been 25 years since we’ve updated the Microsoft logo and now is the perfect time for a change. This is an incredibly exciting year for Microsoft as we prepare to release new versions of nearly all of our products. From Windows 8 to Windows Phone 8 to Xbox services to the next version of Office, you will see a common look and feel across these products providing a familiar and seamless experience on PCs, phones, tablets and TVs. This wave of new releases is not only a reimagining of our most popular products, but also represents a new era for Microsoft, so our logo should evolve to visually accentuate this new beginning.” Read More. SIRI (Speech Interpretation and Recognition Interface) is an intelligent personal assistant and knowledge navigator which works as an application for Apple’s iOS. The application uses a natural language user interface to answer questions, make recommendations, and perform actions by delegating requests to a set of web services. Apple claims that the software adapts to the user’s individual preferences over time and personalizes results, and performing tasks such as finding recommendations for nearby restaurants, or getting directions. Siri was launched first as an application available on Apple’s App Store in the US. It integrated with services such as OpenTable, Google Maps, Movie Tickets and TaxiMagic. Using voice recognition technology from Nuance and their service partners, users could make reservations at specific restaurants, buy movie tickets or get a cab by dictating instructions in natural language to Siri. Siri was acquired by Apple on April 28, 2010, and the original application ceased to function on October 15, 2011. Siri is not Apple’s first venture into voice-activated controls and speech-recognition, although the program makes a few big leaps over the capabilities of VoiceOver, the technology used in Mac computers since OS X 10.4, as well as iPhones since iPhone 3GS. One of the big differences is that VoiceOver was touted as an accessibility feature, meaning it was mostly used by the visually impaired and people who can’t easily operate iPhones (Parkinson’s disease patients, for example), while Siri is meant for the mass market. Apple did not develop this technology in house. 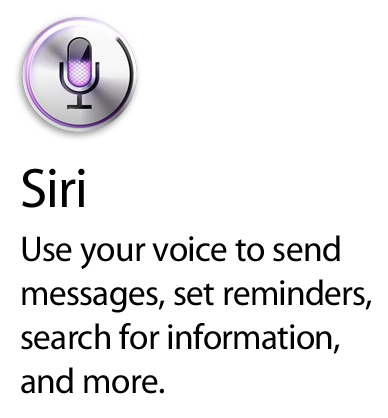 Rather, Apple acquired Siri Inc. in 2010, a company that had developed an iPhone app called Siri Personal Assistant. Sometime after Apple took over the company, the app was pulled from the App Store. The software is technically in beta, so while it’s functional, it does have some limitations. The biggest limitation right now is language support. Currently, you can only use Siri to its full potential when you use American English and you’re physically in the United States. Siri does have options for U.K. English, Australian English, French (France), and German, but if you use the program in any of those language, you can’t search for businesses or locations on a map. One of the striking features of Siri is that it will improve the more people use it. Siri will be collecting data from users, like their regional accents and dialects and common phrases that people use, and analyzing that information to improve. Additionally, the more you specifically use it, the better it understands your particular accent and characteristics of your speech. After reading such great features of this technology of SIRI, you would really be tempted to see it’s Demo. After all this you wish to get one just spend a bit to have Apple IPhone 4s. Seobloggingtips.com organized one cool giveaway few days ago and gave away domain name to winners, well guess what, its even bigger now. This year end they are giving away 2 domain names (.com) for free and a Free Hosting Account from them for one full year. Now before we head on for the setup process. This is my 2nd Post in the Blogging Series. I suppose you are pretty much clear about BLOGS from my previous post and aware of its work and uses. In the Introduction to Blogging, i had said that there are two ways you can use wordpress for your blogs. For those who are new to blogging, you should first read Introduction to Blogging article and then turn back here again. Today we will look at wordpress Self Hosted. So for those who choose wordpress self hosted blog. This article will help them to know the things they require to setup their own wordpress powered blog on their own domain and own Servers. Now you must be thinking why only WordPress and no other blogging Platform. So here’s the answer to your Question? WordPress is a great script. When people think of WordPress, they think of it as just a simple blogging script like any other. But that is when you get it wrong. WordPress is not any blogging software; it is the BEST blogging software which is FREE. WordPress is simple, and we agree with that statement. But due to its simplicity, it is open to possibilities. We have seen WordPress being used in many ways and by some of the top businesses in the industry. It is a powerful tool with robust features. We have compiled a few reasons why you should use WordPress, in what ways you can use WordPress, and who is using WordPress. Rest you can read here at WPBeginner.com . If you need full control over all aspects of your blog including the database, themes and plugins you need a self-hosted blog. Now we have chosen Self Hosted WordPress as we get the entire control over the blog in many ways as Ads, Themes, and Plugins. To understand the difference well read here WPBeginner.com. Now you need to have some points cleared before you Setup WordPress Blog. Below is the Check list you should have a look at. It’s very important to have an appropriate domain name for your blog. As domain will help you rank your blog at better place in search engines. Picking the right domain name for a blog is an essential step to success. Think of a domain name as a brand to your website, and like any other product, a blog will be really hard to rebrand if you decide to choose another name. Proper keywords also do matter while purchasing a domain name. To get to know more visit the link . Now you need a domain registrar from whom you will purchase the domain name. There are hundreds of domain registrars on the web that are offering you domain registration and more. But like many other scams on the web, there are scam domain registrars that disappear every three months, and you get left hanging. Therefore we suggest you get a domain from one of these popular registrars that have been around and have earned a good reputation in the industry. I personally suggest BIGROCK. As they provide good Service. VISIT BIGROCK for all your Web Solutions. Often people overlook this factor of web host. Before you can have a self-hosted WordPress blog with your very own domain name, you must first select a host for your site. The host is the company that provides the server where your site will be digitally stored on a hard drive and be continually connected to the internet where it can be accessed by billions of internet users. All hosts are not created equally, however, so it pays to learn just a little bit about what you should look for in a quality blog hosting company. What Specification does WordPress Require? As a matter of fact most Linux web hosts come pre-installed with WordPress, so you won’t have to worry about what WordPress requires. You should see the bandwidth and web space been provided by the web host you choose for yourself. As i stated above, WordPress is a very light-weight script for a normal blog account, you won’t need a dedicated server. So don’t get that. Majority of top shared hosting sites are now offering unlimited resource, so take advantage of that. That is all what you really need. But if for some reason, you end up going with a service that doesn’t offer unlimited specs what will you do? You need to evaluate. How much space you do need on the web. A WordPress site can run well under 100 MB space. If you are offering downloads, and hosting your own images then you will need more space. A standard hosting environment for blog hosting software will include the following components. Apache web server, which is found on almost 100% of Linux hosting services. SQL server – usually MySQL which will manage the WordPress blog database. A mail host, which allows your WordPress site to send email notifications for things like comments, password resets and administrator functions. Fantastico – allows easy installation of WordPress and many other popular website management tools: Drupal (themes), osCommerce, Moveable Type. Every host that we mention in this post has earned its reputation in the industry. They are top-notch services. If you decide to go with a service other than the ones that we list in this post, make sure you do an extensive research on their reputation, uptime history, and support reviews. Windows hosting – WordPress will run on Windows servers, but it can be a hassle and some features like the very important search engine friendly links (permalinks) can be almost impossible. Avoid Windows Servers for WordPress hosting (this has nothing to do with the Windows on your own PC. Poor support – Before I sign up for any WordPress hosting, I always like to contact support with a question. Just ask “what version of WordPress is your Fantastico currently installing?” if you can’t think of anything else to ask. If it isn’t the latest version, the blog host may not be the most reliable hosting company. If it takes a long time for them to respond to your question (more than a couple hours), move along and select another. Below is the list of what we consider to be the Best Web Hosts for WordPress. All of these hosts have an unlimited spec for you. Bigrock – Our platform powers over 100,000 websites worldwide, makes us one of the most reliable hosting providers globally. We offer Affordable Web Hosting for personal websites, Business Hosting for small business websites and Professional Hosting for large enterprises. Host Gator – Hosts over 2 million domains and is known as one of the well-reputed web host in the industry. They have plans that will suit all your needs. Site5 – One of the most popular web hosts that have special plans just for the WordPress community. Super Green Hosting – A very nice service that is not only WordPress friendly, but it is environment friendly. They have quality customer service and have a good reputation in the industry. Blue Host – Another reliable web hosting company that has been around for a long time. Blue Host has proven its worth to the users, and it is a legit competitor of Host Gator. Choose from any of the web hosts above, and we guarantee you that you will not be disappointed. So I suppose you must have now come to know what all are the requirements for setting up a Self Hosted WordPress blog. My next post will be about how to set up Self Hosted blog on wordpress.org platform and on your own servers and with your domain name. By that time you may buy a server space and domain. Hope this post has given you a bit idea about the requirements of Self Hosted WordPress Blog. So happy blogging. Please give your valuable comments so that I come to understand that I was able to convey the information the right way. This is my around 20th post on this blog of mine. This is a self hosted WordPress blog. I came to know still many aren’t aware of the Blogging concept. So thought of writing a series of post under the Blogging topic. This is my first post in this series. Hope you will be able to understand what I have tried to convey. Before I tell you about the title. Let’s just discuss what all blog is about? Many of you still might me having a question what is Blog? What is WordPress, blogger all about? Here are your answers to that entire bit geeky but simple question which arises out in every person who thinks about blogging world. Blogger – A blog is a personal diary. A daily pulpit. A collaborative space. A political soapbox. A breaking-news outlet. A collection of links. Your own private thoughts. Memos to the world. Wikipedia – A blog (a blend of the term web log)is a type of website or part of a website supposed to be updated with new content from time to time. I say or define as “Blog is a daily journal/diary of yours views and thoughts over a particular topic or thing”. So simple!!! Now have look at this image. This will clear all the remaining doubts about blog. Software that provides a method of managing your website is commonly called a CMS or “Content Management System”. Many blogging software programs are considered a specific type of CMS. They provide the features required to create and maintain a blog, and can make publishing on the internet as simple as writing an article, giving it a title, and organizing it under (one or more) categories. This video may also help you to understand blog a better way. Also this is other video you would like to see. Link :- What is blog ? As you know wordpress is an open source blogging tool and publishing platform powered by PHP and MySQL. It is often customized into a content management system (CMS). So with WordPress.com the hosting and managing of the software is taken care of by the team here at Automatic while with WordPress.org you need to install the software on your own server or with a 3rd party provider. You must upgrade the software manually when a new version comes out. So I suppose you must have decided that you will go for self hosted wordpress blog then it’s really amazing. My next post will be about how to set up Self Hosted blog on wordpress.org platform. Hope this post has given you a bit idea about what all blogs are about. Below are some links of blogging platform where you can create an free account and start blogging too. So happy blogging. Please give your valuable comments so that I come to understand that I was able to convey what I had to convey.